On March 23rd, 2018 a seminar on Intellectual Property Rights will be organized at the Faculty of Chemistry and Pharmacy, Sofia University, Bulgaria within H2020 project Materials Networking. The Seminar will be attended by scientists from the Faculty of Chemistry and Pharmacy, Sofia University, Bulgaria and the lecturers will be as follows: Dr. Eva Martin Fierro – Project Manager – Innovation and Knowledge Transfer, Fundació Bosch i Gimpera, Technology Transfer Office – University of Barcelona and Dr. Radislava Kosseva Industrial Property Representative before the Bulgarian Patent Office Patent representative before the European Patent Office. “Materials Networking” project has received funding from the European Union’s Horizon 2020 research and innovation programme under grant agreement No 692146. Seminar with experts from the partnering institutions dedicated to innovation and commercialization of scientific results will be organized on the 6th of December, 2017 at the Conference Hall of the Faculty of Chemistry and Pharmacy, Sofia University. The seminar will include both: the general approaches for transfer of research results into innovations as well as success stories as examples for such a transfer. Special attention will be paid to the specific approaches to big companies, SMEs, or start-ups. In the seminar will participate senior and junior researchers from the Faculty as well as experts from the related departments of Sofia University (e.g. Technology Transfer Office). The Seminar Programme could be found here. The 2nd School “Computational Modelling of Materials” within the H2020 project Materials Networking will be held on the 4th and the 5th of December, 2017 at the Faculty of Chemistry and Pharmacy, Sofia University. The School is organized for the young scientists from the Faculty of Chemistry and Pharmacy who will be able to learn the advanced methods and applications of computational modeling in the field of the materials science from leading scientists from the three partnering organizations. Confirmed lecturers at the school until now are Dr. Yuki Nagata, Max Plank Institute for Polymer Research, Mainz, Germany, Prof. Eliseo Riuz, Dr. Sergio Madurga, Dr. Pablo Gamallo, University of Barcelona, Spain. The Programme of the 2nd School of the materials Networking project could be found here. The 2nd Workshop “Advanced Materials“, organized within the H2020 project MaterialsNetworking will be held from 10 to 13 September, 2017 in Festa hotel Via Pontica, Pomorie, Bulgaria. The programme of the conference could be seen here. The Book of Abstracts is already available. For more information, please contact the e-mail address of the project: mn@chem.uni-sofia.bg. 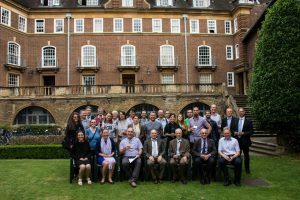 From the 16th to the 21st of July, 2017, the 1st Materials Networking Workshop & Summer School took place at the University of Cambridge, UK. The School was attended by 15 young researchers from the Faculty of Chemistry and Pharmacy, Sofia University and from the Faculty of Chemistry, University of Barcelona. In the Workshop also participated the members of the Management Committee of the project as well as many researchers from the University of Cambridge. The host of the event was Professor A. Lindsay Greer FIMMM Head of School of the Physical Sciences and Professor of Materials Science, Department of Materials Science & Metallurgy. Among the lectures were Professor Chris Abell (FRS, FMedSci Pro-Vice-Chancellor – Research, Professor in Biological Chemistry, Co-founder of Astex Pharmaceuticals, Sphere Fluidics, and AQDOT), Dr Tom Bennett (Royal Society University Research Fellow, Department of Materials Science & Metallurgy), Professor Serena Best (Professor of Materials Science, Deputy Head of Department (Research), Department of Materials Science & Metallurgy), Professor Sir Harry Bhadeshia (FRS, FREng, FNAE Tata Steel Professor of Metallurgy, Department of Materials Science & Metallurgy), Professor Mark Blamire (Head of Department of Materials Science & Metallurgy and Professor of Device Materials). The programme of the event could be found here. The contact person for the event was Dr Stoyan Smoukov, Head of Active and Intelligent materials Laboratory, Department of Materials Science & Metallurgy.